If you are overwhelmed by anxious thoughts or are just simply tired of that uneasy feeling – like there’s something wrong with you… then this will be most important message you ever read… for reasons you’ll soon understand. Discover the Secrets to Break Free From Depression & Anxiety! Hello, I’m Dr. Todd Pressman, Licensed Clinical Psychologist, Nationally Recognized Anxiety Expert, Author, and Speaker. For over 27 years I’ve worked with thousands of anxiety sufferers across the globe through my private practice, published works, and live presentations. Right now, I would like to invite you to discover the most effective methods I’ve found to conquer anxiety and depression – and unleash the true happiness waiting for you. Inside this revolutionary audio program you will find a breakthrough blueprint to enhance your life, boost your happiness, and start living the life you deserve. With this life-changing program in hand, I will share with you the REAL secrets to counteract your anxiety by exposing the hidden thoughts buried within your mind, and provide you with the cutting-edge tools and mind-blowing insight to capture the joyful life you deserve. In other words, I will give a step-by-step program, filled with easy to follow exercises – so you can naturally fight back against your anxiety and depression… by getting down to the real core of the problem. Discover the natural anxiety relief, treatment and cure! And most importantly… begin living and enjoying a life you love! You see, rather than simply addressing the symptoms, which might allow you to feel better for a short time… I will reveal to you my proven strategies to expose the real source of pain in your life, and give you the unique opportunity to experience a deep and fulfilling inner peace. Just imagine how wonderful it would be to feel a new sense of hope, happiness and renewed vigor for life. Start Feeling Happiness Again, Starting Now! Each and every time you complete the exercises provided, you’ll gain further insight into yourself, and take another step towards anxiety cure and start living a life full of happiness and joy. Within minutes of listening to Dr. Pressman’s CD, The Anxiety Miracle, I was comforted to know that all of the situations and circumstances I’ve become so afraid to even think about can be met in the eye and diluted. In addition, the partner CD, The Anxiety Emergency Miracle, had me recognize just how often I put myself into an anxious state – how we all put ourselves in anxious states – and that there really is an opportunity to turn the wheel and release myself from fear…at any time, anywhere. I am grateful to have these tools and now feel a greater sense of confidence and ease in knowing that the techniques to disintegrate my anxiety are already within me. I have struggled with anxiety and severe depression since I was a child, and literally spent most of of my childhood living in fear. After decades of internal struggle and conflict I came across this audio program. I was full of skepticism and doubt that such a program would make a difference in my life – but I decided it was worth a try. By the time the first exercise was complete, I could feel the difference in how I felt and how I viewed the world around me. Needless to say, I eagerly finished the program – and can say it is amazing that you can treat anxiety naturally. This program is a life changer! I can’t thank Dr. Pressman enough for sharing this life altering insight. You see, I have taken the most effective techniques I have discovered in my journeys across the globe… everything I have discovered over the past 27 years…and put them into this short, yet powerful audio program. YOU Can NOW Try This Powerful Program For Yourself… RISK-FREE! I am so confident that you will thoroughly enjoy The Anxiety Miracle, that I will give you the chance to try out the entire program in the comfort of your own home for 14 days – free of risk or obligation. All I ask is that you make a small commitment to yourself and your happiness, and cover the non-refundable shipping and processing fee of just $14.95. This will give you a full two weeks to try out The Anxiety Miracle – and see if it is right for you. If you enjoy The Anxiety Miracle, which I know you will, pay just one payment of just $47 at the end of your trial period. Simply let us know and owe nothing more! No Questions… No hassles – It’s Just That Simple. In fact, we’ll even let you KEEP THE ENTIRE SYSTEM – just for trying it out today! That’s right – if you don’t think this audio program is worth the $47 asking price – just say the word, and we will not bill you AND we will even let you keep the product. Why wait even one more minute, when we can rush you out this life changing audio program right now! Act TODAY – And We’ll Also Send A Bonus CD for FREE! 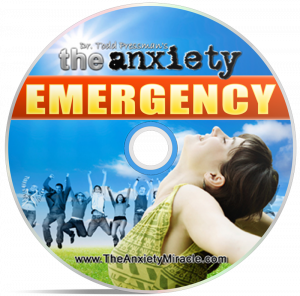 The Anxiety Emergency Audio CD is specifically designed to help you overcome those sudden “panic” attacks that creep up on you at the worst of times! When you need instant results in a hurry… say before a job interview, presenting in front of others, or ANY high anxiety situation… The Anxiety Emergency Miracle is here to help. This additional CD is my gift to you – just for trying out The Anxiety Miracle today. You Can Instantly Download The Anxiety Emergency Miracle – for FREE! With The Anxiety Emergency in MP3 format you’ll be able to listen to this powerful program on your computer, your iPod, or any MP3 audio device at anytime and anywhere you choose! It is our gift to you, as an INSTANT download as soon as you order The Anxiety Miracle audio program. So click on the “Add to Cart” button below, and take the first step towards a life full of happiness and inner peace. You’ll be glad you did – and I’ll look forward to hearing all about your amazing results! This information should not be considered a substitute for professional help from a psychiatrist or psychologist when needed. There are times when medication and the treatment provided by a medical professional can be necessary, depending upon the severity of your condition. Please know, however, that the principles in “The Anxiety Miracle” will be a powerful addition to whatever other treatment you pursue. There’s absolutely no risk associated with using “The Anxiety Miracle” and when applied as instructed, you will find the benefits to be highly effective, enhancing the effects of any other avenue of treatment you undergo.